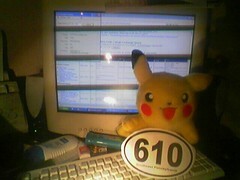 Pikachu is down with the 610. I'm glad to see that Pikachu represents. Holler back to your Southeast Pennsylvania peeps, or something along those lines. Why is Pikachu currently down with the Six One Oh? Because pikachu has peeps there. Pikachu has peeps in the 610. Psiduck? Charmander? Jigglypuff? Domo-kun? Thanks for the backup Paul. I'm the 610er... 610ite... whatever it would be.